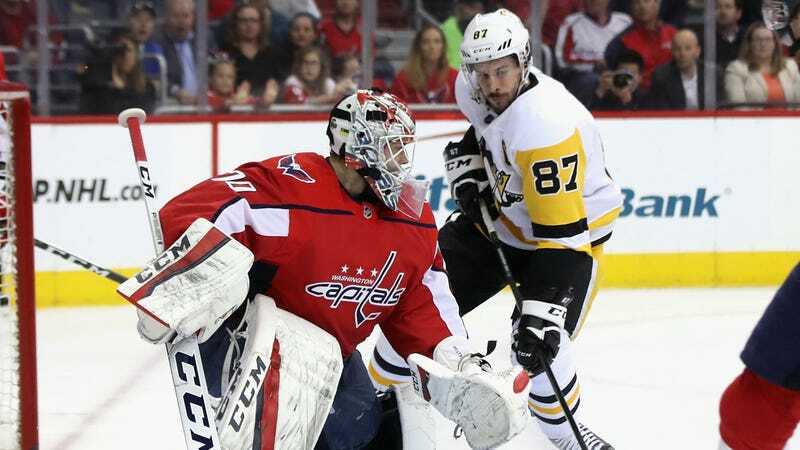 Behind a lead-off goal 17 seconds in from Evgeny Kuznetsov, and a sniper shot at the start of the third from Alex Ovechkin, the Capitals were cruising tonight with a two-goal lead in Game 1 of their second-round series against the Penguins. But in the span of five minutes, it all fell apart, as three unanswered Pittsburgh goals granted Sidney Crosby’s team the comeback win, 3-2, and gave the Penguins the upper hand as they look to eliminate the Caps in the playoffs for the third year in a row. Down Evgeni Malkin—and less importantly, Carl Hagelin—to injuries, the Penguins were initially unable to solve the sudden brick wall that was Caps goalie Braden Holtby, who came into tonight undefeated in the four playoff games he’s started. In the third period, however, the Penguins found the answers, and what looked like at least a safe-ish Washington lead very quickly disappeared. The first Pittsburgh goal—a deflection in traffic off Patric Hornqvist—wasn’t Holtby’s fault. But the second and third—from Crosby and Jake Guentzel, respectively—both beat him short side in pretty pathetic ways. With a less than fully healthy opponent, a dream start, and the momentum of a four-game win streak all on their side, this is another Capitals loss that really stings. It’s another example of Pittsburgh seemingly taking whatever they want from Washington, and for the rest of the series, no lead will feel like enough. Still, it’s not like this is unfamiliar territory for these Capitals, and no matter what happened in the past, a one-goal loss is far from a killer blow. Eventually (maybe), a team can start learn from history.